American engineer mission specialist astronaut 1996-2018. Status: Inactive; Active 1996-2018.. Born: 1961-07-27. Spaceflights: 3 . Total time in space: 188.91 days. Birth Place: Manchester, Connecticut. Grew up in Tolland, Connecticut. Served in US Coast Guard. EDUCATION: �Graduated from Tolland High School, Tolland, Connecticut, in 1979.� Received a Bachelor of Science degree in Electrical Engineering from the U.S. Coast Guard Academy in 1985 and a Master of Science degree in Aeronautical Science from Embry��Riddle Aeronautical University in 1990. NASA EXPERIENCE:� Selected by NASA in April 1996, Burbank reported to the Johnson Space Center in August 1996.� He worked technical assignments in the Astronaut Office Operations Planning branch and International Space Station branch and served as Capsule Communicator (CAPCOM) for both space shuttle and station missions.� He was also a member of the Space Shuttle Cockpit Avionics Upgrade design team.� From January 2007 to December 2009, Burbank served as a Professor of Engineering at the U.S. Coast Guard Academy, where he taught Astronomy, Aerodynamics and Statics & Engineering Design. STS-115 Atlantis (September 2006) International Space Station assembly mission. �During the 12-day mission, the crew delivered and installed the P3/P4 truss and solar arrays that provide about one fourth of the station's electrical power. �Burbank performed a spacewalk to complete truss installation, activate the solar alpha rotary joint and enable the solar array deployment. Born July 27, 1961 in Manchester, Connecticut, but considers Tolland, Connecticut, to be his hometown. Married. Two children. Enjoys running, skiing, hiking, sailing, amateur astronomy, playing guitar. His parents, Daniel and Joan Burbank, reside in Tolland, Connecticut. His sister, Suzanne Burbank, resides in Colorado Springs, Colorado. Graduated from Tolland High School, Tolland, Connecticut, in 1979; received a bachelor of science degree in electrical engineering from the U.S. Coast Guard Academy in 1985, and a master of science degree in aeronautical science from Embry-Riddle Aeronautical University in 1990. American Institute of Aeronautics and Astronautics (AIAA); National Space Society; Order of Daedalians; U.S. Coast Guard Pterodactyls; U.S. Coast Guard Academy Alumni Association. Air Medal, Coast Guard Commendation Medal, Coast Guard Achievement Medal, 2 Coast Guard Commandant's Letter of Commendation Ribbons, 3 Coast Guard Meritorious Team Commendations, National Defense Service Medal, Humanitarian Service Medal, various other service awards. Awarded the Orville Wright Achievement Award and honorary membership in the Order of Daedalians as the top naval flight training graduate during the period January 1 to June 30, 1988. Awarded Texas Society of the Daughters of the American Revolution Achievement Award as the top Coast Guard graduate of flight training for the year 1988. Burbank received his commission from the U.S. Coast Guard Academy in May 1985, and was assigned to the Coast Guard Cutter Gallatin (WHEC 721) as Deck Watch Officer and Law Enforcement/Boarding Officer. In January, 1987, he reported to naval flight training at Pensacola, Florida, and graduated in February 1988. Burbank was then assigned to Coast Guard Air Station Elizabeth City, North Carolina, where he became an Aircraft Commander in the HH-3F Pelican and then an Aircraft Commander/Instructor Pilot in the HH-60J Jayhawk. While at Elizabeth City, he completed training in Aviation Maintenance/Administration in preparation for assignment as an Aeronautical Engineering Officer. He also earned a master's degree in aeronautical science. In July 1992, Burbank was assigned to Coast Guard Air Station Cape Cod, Massachusetts, as the Rotary Wing Engineering Officer and HH-60J Aircraft Commander/Instructor Pilot. In May 1995, he was assigned to Coast Guard Air Station Sitka, Alaska, as the Aeronautical Engineering Officer and HH-60J Aircraft Commander. Burbank has logged over 3,000 flight hours, primarily in Coast Guard helicopters, and has flown more than 1,800 missions including over 300 search and rescue missions. Selected by NASA in April 1996, Burbank reported to the Johnson Space Center in August 1996 to begin two years of training and evaluation. Successful completion of initial training will qualify him for various technical assignments leading to selection as a mission specialist on a Space Shuttle flight crew. Family: Astronaut. Country: USA. Spacecraft: ISS. Flights: STS-106, STS-115, Soyuz TMA-21, Soyuz TMA-22. Agency: USCG. Bibliography: 12, 5220. 1961 July 27 - . Birth of Daniel Christopher Burbank - . Nation: USA. Related Persons: Burbank. 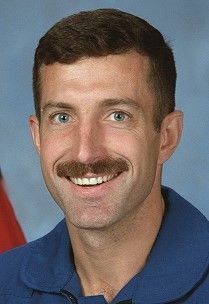 American engineer mission specialist astronaut 1996-2018. 3 spaceflights, 188.9 days in space. Flew to orbit on STS-106 (2000), STS-115, Soyuz TMA-22..
2000 February 24 - . ISS Status Report: ISS 00-08 - . Nation: USA. Related Persons: Altman, Burbank, Halsell, Helms, Horowitz, Malenchenko, Mastracchio, Morukov, Voss, Weber, Mary, Wilcutt, Williams, Jeffrey. Program: ISS. 2000 September 8 - . STS-106 Mission Status Report #01 - . Nation: USA. Related Persons: Altman, Burbank, Lu, Malenchenko, Mastracchio, Morukov, Wilcutt. Program: ISS. Flight: STS-106. 2000 September 9 - . STS-106 Mission Status Report #04 - . Nation: USA. Related Persons: Altman, Burbank, Lu, Malenchenko, Mastracchio, Morukov, Wilcutt. Program: ISS. Flight: STS-106. STS-106 Mission Status Report #03 - . Nation: USA. Related Persons: Altman, Burbank, Lu, Malenchenko, Mastracchio, Morukov, Wilcutt. Program: ISS. Flight: STS-106. 2000 September 10 - . STS-106 Mission Status Report #06 - . Nation: USA. Related Persons: Burbank, Lu, Malenchenko, Mastracchio. Program: ISS. Flight: STS-106. STS-106 Mission Status Report #05 - . Nation: USA. Related Persons: Altman, Burbank, Lu, Malenchenko, Mastracchio, Morukov, Wilcutt. Program: ISS. Flight: STS-106. 2000 September 11 - . STS-106 Mission Status Report #08 - . Nation: USA. Related Persons: Altman, Burbank, Lu, Malenchenko, Mastracchio, Morukov, Wilcutt. Program: ISS. Flight: STS-106. 2000 September 12 - . STS-106 Mission Status Report #10 - . Nation: USA. Related Persons: Altman, Burbank, Lu, Malenchenko, Mastracchio, Morukov, Wilcutt. Program: ISS. Flight: STS-106. 2000 September 13 - . STS-106 Mission Status Report #12 - . Nation: USA. Related Persons: Altman, Burbank, Lu, Malenchenko, Mastracchio, Morukov, Wilcutt. Program: ISS. Flight: STS-106. 2000 September 14 - . STS-106 Mission Status Report #14 - . Nation: USA. Related Persons: Altman, Burbank, Lu, Malenchenko, Mastracchio, Morukov, Wilcutt. Program: ISS. Flight: STS-106. STS-106 Mission Status Report #13 - . Nation: USA. Related Persons: Altman, Burbank, Lu, Malenchenko, Mastracchio, Morukov, Wilcutt. Program: ISS. Flight: STS-106. 2000 September 15 - . 2000 September 16 - . STS-106 Mission Status Report #18 - . Nation: USA. Related Persons: Altman, Burbank, Lu, Malenchenko, Mastracchio, Morukov, Wilcutt. Program: ISS. Flight: STS-106. STS-106 Mission Status Report #22 - . Nation: USA. Related Persons: Altman, Burbank, Lu, Malenchenko, Mastracchio, Morukov, Wilcutt. Program: ISS. Flight: STS-106. 2000 September 19 - . STS-106 Mission Status Report #24 - . Nation: USA. Related Persons: Altman, Burbank, Lu, Malenchenko, Mastracchio, Morukov, Wilcutt. Program: ISS. Flight: STS-106. Landing of STS-106 - . Return Crew: Altman, Burbank, Lu, Malenchenko, Mastracchio, Morukov, Wilcutt. Nation: USA. Related Persons: Altman, Burbank, Lu, Malenchenko, Mastracchio, Morukov, Wilcutt. Program: ISS. Flight: STS-106. STS-106 landed at 07:56 GMT. .
2006 September 11 - . 2006 September 12 - . 2006 September 13 - . 09:05 GMT - . EVA STS-115-2 - . Crew: Burbank, MacLean. EVA Duration: 0.30 days. Nation: USA. Related Persons: Burbank, MacLean. Program: ISS. Flight: STS-115. The crew continued work on the P3/P4 truss, which allowed the truss' solar arrays to be deployed on 14 September..
2006 September 21 - . 2006 September 21 - . 10:21 GMT - . Landing of STS-115 - . Return Crew: Burbank, Ferguson, Jett, MacLean, Stefanyshyn-Piper, Tanner. Nation: USA. Related Persons: Burbank, Ferguson, Jett, MacLean, Stefanyshyn-Piper, Tanner. Program: ISS. Flight: STS-115.